Your favorite home-away-from-home app has an intriguing new offering: The chance to get a behind the scenes look at your favorite dance companies. With the launch of its new Experiences section, Airbnb has begun letting travelers get to know the places they visit not only by staying in a real home (or treehouse or Airstream trailer), but also by experiencing the destination with locals who share their interests—whether that’s whiskey drinking, truffle hunting, sushi making, or, yes, even dancing. Unsurprisingly, two of the first dance companies to sign up are based in Airbnb's hometown: San Francisco. 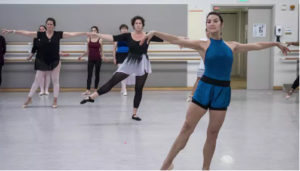 The Ballet experience is hosted by former San Francisco Ballet soloist Pauli Magierek, who will meet you at the War Memorial Opera House and whisk you right to the barre for a beginner/intermediate ballet class taught by an SFB faculty member. The following night, you’ll attend a performance, drink champagne and eat chocolates at intermission, then go backstage to meet a dancer or two for an insider perspective after the show. Bonus: You'll also get a pair of autographed pointe shoes. The two-day itinerary costs $250 per person, but because this is one of Airbnb's Social Impact Experiences, 100 percent of what you pay goes directly to SFB to help under-served children and their families attend a performance of the Nutcracker at no cost. Watch a trailer for The Ballet experience here. If you're looking for something more contemporary—or have a smaller budget—check out the 3-hour Move on Market Street experience at Alonzo King LINES Ballet, hosted by the company’s community and teen program coordinator, Briana Dickinson. From the description, it sounds like you could get a glimpse at a rehearsal or composition exercise with either the company or student dancers at LINES Dance Center before you head into the studio yourself for a private Pilates class. You'll also be given "a piece of LINES gear," which we're assuming is something along the lines of a branded t-shirt or tote bag. Your $125 fee will support the continuation of the contemporary ballet company’s groundbreaking work. To browse for experiences in your next destination—burlesque lessons in London, anyone?—use the Airbnb app or click here. Or, if you're interested in hosting an experience at your company, it's easy to create one on the site—all you need is an Airbnb account and a great idea.